Our Corfu sight seeing guide is designed to help holiday makers as well as travellers decide which of the islands sights and attractions they want to visit whilst on the island. If you’re one of those people who simply goes to a nice hotel in a village with a beach and spends your whole week either in the pool or in the sea then this page is probably unnecessary. However, if you are someone that wants to see the cultural sights and learn about the history of the island then this is the page for you. This is also the page for you if you have kids that you want to keep entertained as it’ll help you to find things to do that they might enjoy. The map above will help you to see where each village is and then you can check out where the attractions and beaches are on the Corfu beach guide and Corfu sight seeing guide and pick the perfect spot for your trip. Corfu has a number of historical sites including a couple of Venetian castles in the capital Kerkyra. As well as a pair of byzantine castles too, one in north west close to Paleokastritsa and one close to the centre of the island, just north of Halikounas beach. Corfu is a popular island for families so naturally there are a number of activities to keep little ones entertained. There are 3 water parks, Aqualand, Hydropolis and the Sidari water park. Another option for the youngsters is a trip to the aquarium where they can learn about and interact with some of the local wilflife as well as some more exotic animals too. There’s also a virtually endless supply of great kid friendly beaches and hotels with pools so you won’t be short of ways to tire them out. 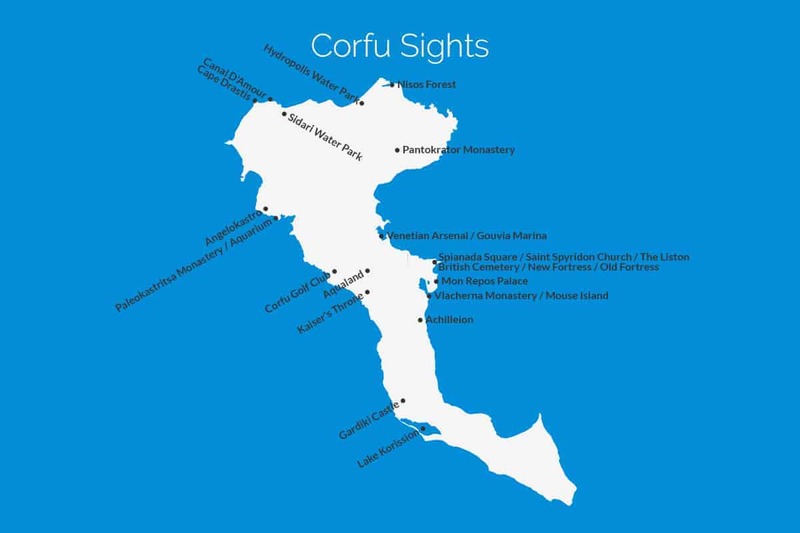 Listed below are the 26 main attractions on Corfu, all you have to do is click the ones you are interested in and that’ll take you to a page that gives you a more in depth look at that particular place with descriptions, map, quick look icons and much more. Alternatively click a filter to narrow down the list of sights to just those that are the type of things you’re looking for. When you choose a filter it removes any previous filters that were applied. Achilleion is a palace in the east of Corfu, approximately 10km south of Kerkyra and set in beautiful, well kept grounds. It was built by Elisabeth of Bavaria who was also known as Sissi, hence the name, Sissi’s Palace. Achilleion’s location offers a panoramic view of Kerkyra to the north as well as the entire southern part of the island. Angelokastro is a Byzantine castle located on the west coast of Corfu. Although the majority of the castle has fallen into disrepair there is a small underground chapel that’s interesting to have a look around. Angelokastro is about 1000 feet above sea level which means it offers incredible views over the west coast and Corfu as a whole. Aqualand is a water park that lies a few minutes south west of Kerkyra in the centre of Corfu. It features all the usual rides like pirate play area for young kids. Gentle slides, a lazy river and a wave machine for those a bit more adventurous and free fall slides and hurricane slides for the thrill seekers. There really is something for everyone. The aquarium is on the north west of the island close to Paleokastritsa. It’s a wooden building with several tanks inside, the larger ones featuring lobsters, octopuses and eels and smaller tanks with many types of fish and other sea life. There’s also a section with exotic creatures such as snakes, lizards and chameleons among others. The British cemetery is a quiet place often missed by tourists, it’s located in the capital Kerkyra and is well worth a visit, the custodian George is always happy to speak to visitors and show people around. Just remember to wear insect repellent as mosquitoes and other biting insects are rife in the cemetery. Canal D’Amour is a beauty spot on the north coast of Corfu, close to Sidari, it’s famous for its tunnel of love and unusual rock formations and offers stunning views when strolling round the cliffs. There is a beach and some tavernas here as well making the area the perfect place to spend a few hours or the entire day. Cape Drastis is a private section of the coast up in the far north west of the island that offers spectacular 360 degree views. The gorgeous white cliffs offer amazing backdrops and the area is understandably popular with photographers. Lately it has been reported that the gate is shut and there’s no access to the cape itself. The church of Saint Spyridon is located in the old town of Kerkyra and worth a visit whether you are religious or not. It’s a Greek Orthodox church that was built in the 1580s and boasts the highest bell tower in the Ionian islands. The church has a spiritual calm about it that makes a lovely change to the busy streets of Corfu town outside. The Corfu Golf club is approximately 14km west of Kerkyra. It’s an 18 hole par 72 course set in lush green countryside with trees surrounding the fairways, bunkers, ponds and streams to be avoided as well, the course is open 7 days a week and there is also a driving range and putting green. Clubs, carts and buggies can all be hired. Gardiki Castle is a 13th-century Byzantine fort on the south west coast of Corfu. It’s an unusual octagonal shape with towers at the corners and although partially demolished it’s still an impressive site. The entrance is well preserved and the towers retain their full height so you do get some sense of how impressive the castle would have been. Gouvia Marina is a large privately owned marina close to Gouvia village on the east coast and just 12km from Kerkyra. It has about 1200 berths and operates 24 hours a day. From the marina you’ll be able to join many excursions either around the island of Corfu or over to mainland Greece or another nearby island. Hydropolis water park is found on the north coast of Corfu close to Acharavi, it’s a relatively small park but has a good selection of slides, a lazy river and other games and entertainment. They also offer all inclusive days on Mondays and Thursdays. Unfortunately it’s currently only open to guests of the Gelina Village resort and spa. Kaisers Throne is one of the highest points in Corfu and is located west of the capital Kerkyra, it has a horseshoe shaped viewing deck with some built in binoculars but even without them you get spectacular panoramic views of the island. On a clear day you can even see both the east and west coasts of Corfu. Lake Korission, sometimes called Lake Korisia is in the south west of the island not far from Gardiki. The Lake is over 5km long from one end to the other and roughly 1.5km across as its widest point making it around 24 square kilometres in area, this means it’s home to a vast amount of both native and migrating birds. Mon Repos is a palace located just south of Kerkyra in the forest of Palaiopolis. It was formally a residence for the British commissioner as well as housing a school of fine art. It was also the birth place of Prince Philip, the Duke of Edinburgh on 10 June 1921. Nowadays it is known as Paleopolis Archaeological Museum. Mouse Island, otherwise known as Pontikonisi is a small island off the east coast of Corfu just south of the airport. It’s called mouse island because the white stone steps that lead up to the monastery of Pantokrator look like a mouses tail from a distance. The island is a short boat ride from the mainland and is a good place for a wander. The New Fortress is a Venetian castle in Kerkyra and was built at the top of St. Marks hill. The views from the castle are amazing especially at sunrise or sunset. Keep in mind that there are a lot of steps and walking around but you can always rest in the cafe at the top where you can get some fresh squeezed orange juice or a snack. Nisos is a small forest that’s great for a quiet walk, there’s a gravel path that leads through the forest from Agios Spyridon beach in the east to Almiros beach in the west passing the abandoned monastery of Agía Ekateríni. The entire walk would probably only take around 20 minutes in total unless you stop along the way. The Old Fortress, otherwise known as Paleo Frourio is a Venetian fort in the capital Kerkyra. In the daytime it costs 6€ for adults with kids getting in free. In the evenings entrance is free for everyone. Once inside you’ll find a number of exhibits with information explaining them. There is also a lighthouse at the top of some steep steps. Paleokastritsa Monastery is a small and Picturesque monastery located towards the north west of the island. You’ll enjoy the small courtyards with fragrant plants in terracotta pots and the calm and peaceful atmosphere is a welcome change from the tourist hot spots, not to mention there are spectacular views too. The little church of Pantokrator is located at the top of mount Pantokrator which is the highest point on the island. You’ll find it towards the north east of the island and as you might expect the views from up there are second to none, on a clear day you can see the whole of Corfu and even over to mainland Greece and Albania too. The Sidari Water Park is attached to the hotel of the same name and is found in the north west village of Sidari. It’s not on the same scale as Aqualand but if you’re staying in the hotel anyway you get unlimited use of the slides , alternatively you can buy a day pass at 5€ per person or a summer pass for 10€ per person. The Spianada is a large square located in front of the old Fortress in Corfu town. It is a central hub of the town, the Liston is part of the square and cricket is played on the esplanade. There’s also lots of restaurants around the square that makes for an enjoyable place to simply sit and watch the world go by. The Liston is a beautiful building that runs down one side of Spianáda square, it’s widely considered the heart of Corfu town and consists of Napoleonic style arcade terraces. The Liston was built in 1807 by the French imperial commissioner Mathieu de Lesseps and is reminiscent of St Marks square in Venice. The Venetian Arsenal is a shipyard located behind the marina at Gouvia on the east coast. The Venetian Arsenal was built around 1778 and was supposed to be used for to repair the Venetian ships but Venice limited it’s use to simple maintenance, it’s usage declined until it was decommissioned just 20 years later in 1798. Vlacherna is a small monastery on an islet located in the bay to the south of Kanoni, close to Mouse island, There’s a small chapel a place to light a candle and a gift shop. Don’t expect to spend a great deal of time here but combined with a boat trip over to mouse island it’s a nice place to visit for a morning or afternoon. We want Which Greek Island to be as accurate and informative as possible, so, if you notice anything wrong with the Corfu Sight seeing guide or any other page please let us know. We’re also on the lookout for great photos to show people what the places we’re describing are like. If you have photos from any of the attractions in Corfu or from any of other island on the site then we’d love to see them, simply click the button below to go to the photo upload page. Thanks.